Fangoria always had great ads for new movies and/or home video releases. Many of them in glossy color and many others were awesomely full page. This year I’ve already showed you full page ads for The Pit & the Pendulum and Zombie Nightmare. Now let’s take a look at some more of my favorite movie ads from Fangoria magazine. 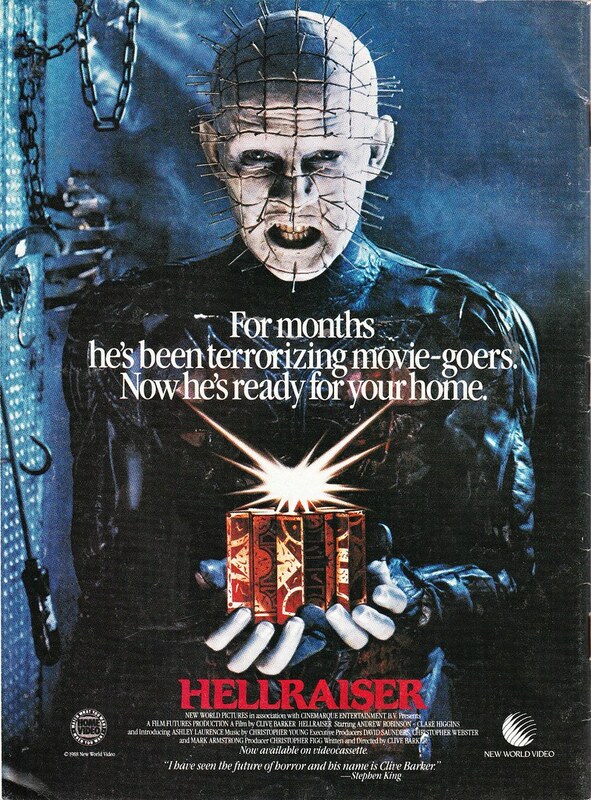 A 1988 full page ad for the first Hellraiser movie on home video. This is truly a gorgeous ad. Next up is a great color half page ad from 1987 for the home video release of Nightmare on Elm Street 3: Dream Warriors. Fangoria would usually only show movie ads for new video releases. Only sometimes would you get an ad for a movie that was out in the theater. 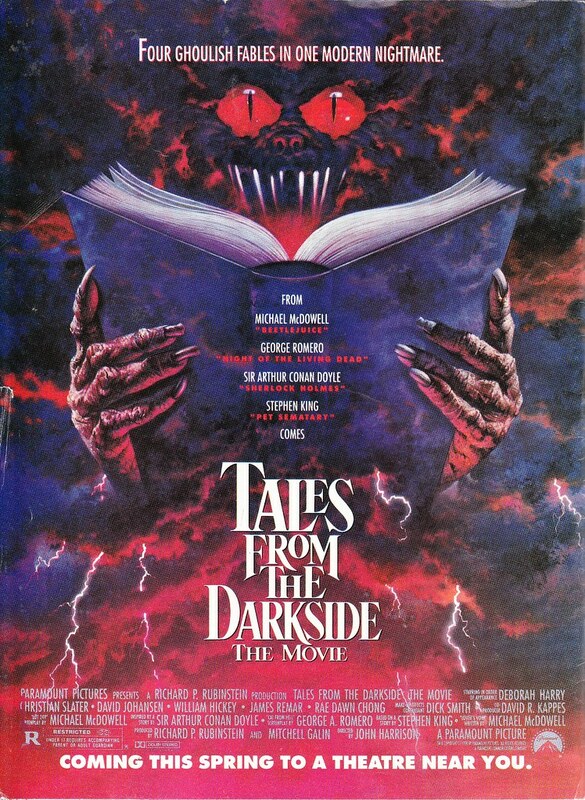 This is one of those times and it’s a huge full page color ad for the Tales from the Darkside movie in 1990. 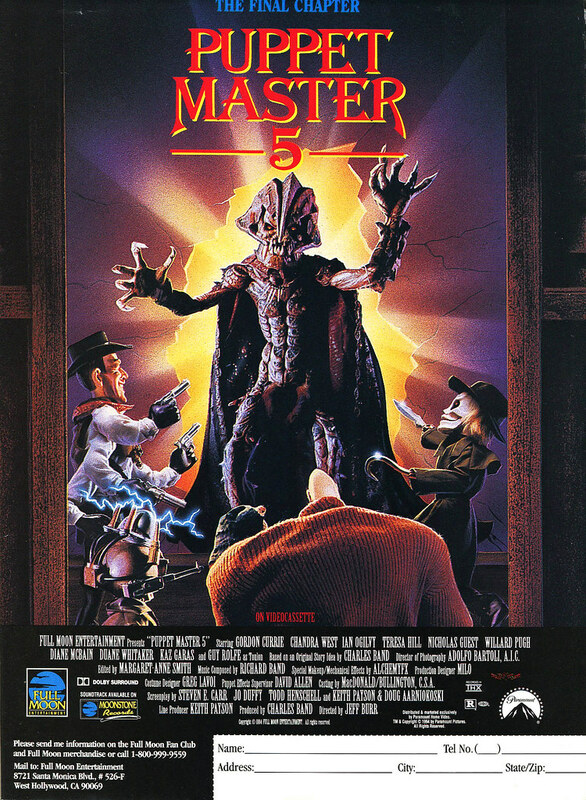 Here is an amazing 1995 ad for Puppet Master 5. I knew about the Puppet Master franchise, I just didn’t know it got up to Part 5 (holy sh*t, there’s been about 10 of those movies!!). This next ad is one of the most mind boggling pieces of stitched together randomness I have ever seen. I mean WTF is even going on there? Tim, Thomerson is carrying a regular handgun. On a horse. Which is standing on top of a giant cut down tree. With an alien landscape wallpaper image from 1992 in the background. And a futuristic looking chick with a sword. What?! And it’s yet another sequel I had no idea existed. 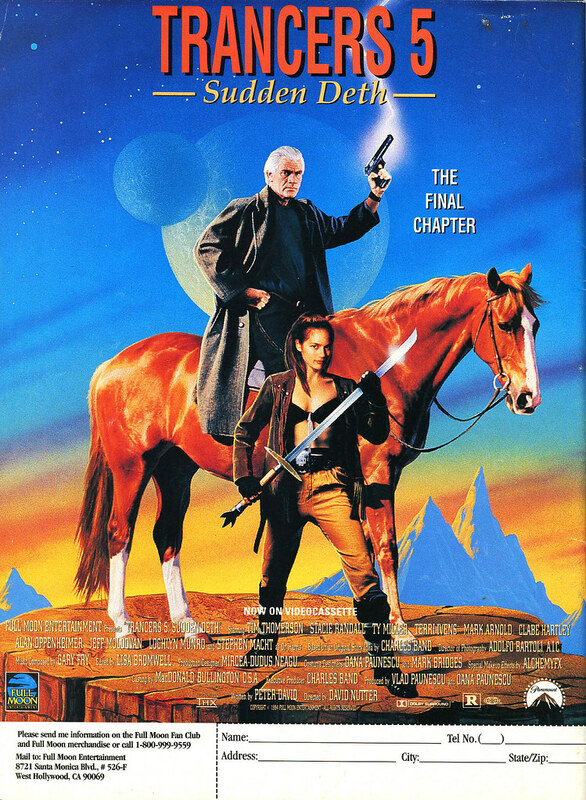 It looks like the first Trancers started way back in ’85 and Tim Thomerson was in that one too. And Helen Hunt. I may have to give that one a watch. It looks like Thomerson was in all 5 of these Trancers movies. Interesting. This random collection of images definitely makes me want to see what the hell this movie franchise is about. Want to see some more full page movie ads from Fangoria? Check out this article from last year’s AWESOME-tober-fest. This entry was posted on October 29, 2014 at 8:00 am and is filed under Fangoria, Genres, Halloween, holiday, horror, magazine, movies, nostalgia, pop culture with tags AWESOME-tober-fest, AWESOME-tober-fest 2014, Elvira, Fangoria, Halloween, magazines, movies, Nightmare on Elm Street, nostalgia. You can follow any responses to this entry through the RSS 2.0 feed. You can skip to the end and leave a response. Pinging is currently not allowed. Reblogged this on Killer Kitsch.